Millions of Sri Lankans are struggling every day to stretch the value of the biggest denomination note in their hands. It does not go far. The cost of goods and services is rising faster than their wages. Real wages declined in the public and private sectors, while wages have risen in the informal private sector. People’s incomes can’t keep up with housing and education costs, bus and rail fares, medicine, gas, electricity, telephone bills, petrol, let alone the staple diet, bread, sugar, fish, meat, and vegetables. Government finances are in a perilous state and the rupee continues to weaken. Unsustainable fiscal deficits and massive domestic and foreign debt, and tax revisions are among factors that have contributed to rising prices at the wet market, the bakery, and the pharmacy. Once again, for the 11th time, the Sirisena-Wickremesinghe Government borrowed US$1.5 billion to be paid in 10-years at an interest rate of 6.2 percent. Indebted Sri Lankans will carry this burden, too. The US$1.5 billion would not be enough to pay for the imports in all of February this year. The rupee weakened against the US dollar by 1.8% so far this year and performed even worse against other currencies, including the British pound, the Australian dollar and the yen. Last year, the rupee tumbled by nearly 4% against the US dollar. This feeds into the cost of essential goods and services that Sri Lankans buy because most of it is imported — from rice and dhal to petrol, washing machines and Toyota Land Cruisers for lawmakers. In February, the Government imported rice worth US$36 million compared with US$1 million in the same month the year before. Sri Lanka also imported US$112.9 million worth of building materials that month – nearly double the value of vegetables and dairy imports. Consumer prices doubled to 8.4% in April this year from 4.3% in April last year, the national consumer price index shows. Food prices increased in April by 11.8% while for non-food items such as household goods, medicine, water, electricity, and gas increased by 5.9%, the index shows. Several tax revisions have contributed to price increases of some consumer goods. The Value Added Tax rate was increased from 11% to 15 % and the VAT exemptions on several items were removed, in May, 2016, contributing to a gradual rise in prices. According to the Central Bank annual report 2016, although the VAT increase was suspended in July, there was no drop in prices in the health services. So, the VAT was re-imposed in November, which led to an increase mainly in non-food prices. 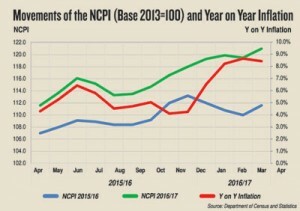 This year, the retail price of Nadu, Samba, Kekulu (red), and Kekulu (white), have risen. Nadu sells for Rs 80 to Rs 88, Kekulu (red) (Rs 78-Rs 87), Samba (Rs 90-Rs 97) and and Kekulu Rs 78-86, while the prices were relatively low last year with the four varieties selling at an average of Rs 69, Rs 60, Rs 90 and Rs 65 respectively. The adverse weather has resulted in a significant escalation in prices of fish as well, compared with last year. According to the Sri Lanka Central Bank price report, at the Peliyagoda fish market, the price of 1 kilo of kelawalla has jumped to Rs 960 from Rs 685 last year. In addition the price of 1 kilo of thalapath and paraw increased by Rs 250 and Rs 110 compared with last year. These are now being sold at Rs 980 and Rs 920 respectively. In retail fish markets around Colombo, the price of kelawalla, thalapath and paraw range between Rs 930 and Rs 1,313, Rs 780 and Rs 1,154 and Rs 920 and Rs 1,320 respectively. It is believed that fish prices are rising also because large scale restaurants are buying wholesale amounts at retail rates. This has affected the retail price of many fish varieties, particularly prawns. 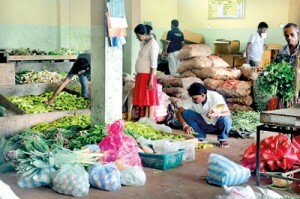 Vegetables, red-onion, coconut and coconut oil prices are also high in the Pettah market. A coconut costs almost 60% more compared with the same period last year. A nut sells for Rs 75 compared with Rs 46-Rs 48 last year. Fees for medical check-ups and laboratory tests have increased significantly within a few months. A leading private hospital in Colombo offers a heart check-up for Rs 24,500. It was Rs 23,500 earlier. A medical test for cancer is Rs 32,500, which had earlier cost Rs 31,000. Pharmaceutical drugs, whether it be for diabetes, heart disease, cancer, or kidney failure, continue to cost more. Some pharmacists say vitamins are especially expensive. Construction materials are costly, too. The price of steel bars (reinforcing bars) has increased three times this year alone. An owner of a hardware store in Kadawatha, said the price of a tonne of bars has jumped from Rs 119,000 to Rs 132,000. A cube of river sand is now sold for about Rs 16,000. It cost less than Rs 14,000 last year. Vendors are disappointed because turnover falls when prices rise. Thilak Kodippili, an owner of a hardware store in Dehiwala said he was alarmed adding that the government should intervene to control runaway prices. Many traders are also giving discounts to help boost sales. A retail trader said that an electric fan priced at Rs 6,990 is being offered for Rs 6,090. But, he said prices of electrical goods has risen. The same electric fan was being sold for Rs 4,990, three to four months ago. The prices of wooden furniture has also increased dramatically. A furniture trader said more than a 20% price increase was seen compared with last year. He attributed it to the shortage of timber. A dining table which now sells for Rs 97,000, earlier sold for Rs 89,000 and a wooden chair is now being sold at Rs 5,250 compared with Rs 4,700 last year. Monthly transport charges for school children have also increased by between 5% and 10%. The chairman of All-Island Inter-District School Children’s Transport Service Association, N M K Harischandra Padmasiri claimed the a tyre now costs Rs 8,500, up from Rs 7,500. Lubricants are also expensive. Sandun Jayamal, a worker at a motor vehicle repair centre in Battaramulla said the price of engine oil has increased dramatically from Rs 4,425 to Rs 5,225 within a few weeks. The tuition fees have risen as have the prices of school stationery. A bookshop owner said A4 sheets, carbon paper, pencils and exercise books are more costlier. Ranjith Vithanage, the president of the National Movement for Consumer Rights Protection, charged that price controls are not working. Meanwhile, a senior official of the Consumer Affairs Authority said, regular raids are carried out against those breaking the law on price-controlled items. But in reality, traders continue to sell at prices they determine.